Jim Higgins is dismissing speculation that FG HQ are trying to get rid of him, but says he’ll fight any attempt they make to run another candidate in next year’s European elections. 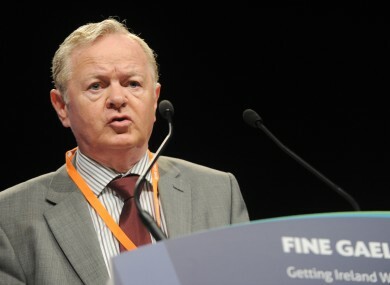 FINE GAEL MEP for the North West region Jim Higgins maintains he’s “fighting fit” and determined to face any attempt to remove him from the party ticket ahead of next May’s European elections. It follows speculation that the party may try and run TD John O’Mahony — one of four Fine Gael deputies elected in Enda Kenny’s Mayo stronghold; with the logic being that the party is considered as unlikely to retain all of those seats in the next general election. Speaking to TheJournal.ie last month, O’Mahony said he was not in the business of trying to sideline anybody, but that “if there was a vacancy that would be a different thing”. Higgins has dismissed the speculation as a “silly season” story, and while admitting a poor relationship with Fine Gael HQ, he said there was “no indication” that they are engaged in “some sort of devious plot to oust me”. “But if there is, and if there is at any stage an indication that they are going to oust me — as Margaret Thatcher said at one stage – I’m ‘not for turning’”. “The one thing I do know is that I’m going to be a candidate for Convention, and then it’s up to membership to decide, ” he told RadioEP.ie, adding that he had received “tremendous encouragement” from voters in the area. Ireland is to lose an MEP next year as a result of Croatia’s accession to the European Union, and a number of options for the re-drawing of electoral boundaries are currently being considered by the Constituency Commission. A decision will be delivered at the end of the month. Several of those options include proposals to merge parts of the current East constituency with the North West, which could mean Higgins and MEP Mairead McGuinness competing for votes in a four-seater. Higgins said it “would be brilliant” if that came to pass, and said he would be confident of the party taking two of the four seats in any enlarged constituency. “I think the chemistry’s absolutely perfect,” he said, adding that McGuinness had been “une damme formidable in terms of performance” in the European Parliament since her election in 2004. Email “Fine Gael MEP says he'll "resist any move" to oust him ”. Feedback on “Fine Gael MEP says he'll "resist any move" to oust him ”.